Oh hi long lost friends! It’s been quiet ’round here this week. How’ve you been? The gallery wall I just installed in our basement is the one of many I have done in our houses over the years, and the third gallery wall in this house alone. And the living room with old black & whites. 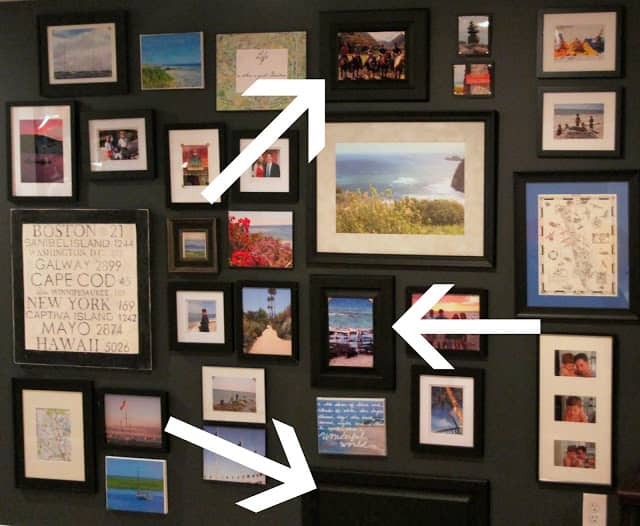 When I was pulling together the travel wall for our basement, I wanted to mix up sizes and shapes of the frames, while making the grouping cohesive with the same color frames (black). 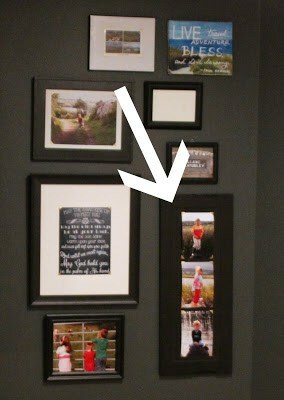 I also intentionally used colored photos on this wall for a big pop of fun color in this room. There’s plenty of room to add more photos over the years, and that is by design too. When I painted our kitchen cabinets three years ago, I removed a few of the doors for a little open shelving action…..
and always thought the doors would be fun to use for a sign or something interesting. Fast forward to the basement gallery wall. The paneled doors made great chunky frames. I simply spray painted the cabinet doors black, trimmed photos to fit, and mounted them to the top of the panel with a glue stick. To give them a more finished look, I added gold foil photo corners. I love how the gold pops against the black. The long doors were great for filling in awkward spaces. The self-adhesive mounting corners can be found at Michaels or AC Moore, or on Amazon. 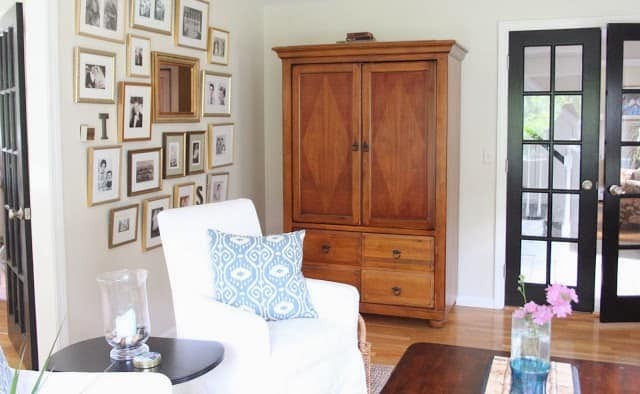 So there you have it – a quick and easy way to repurpose cabinet doors and a way to add some interest to your gallery wall! 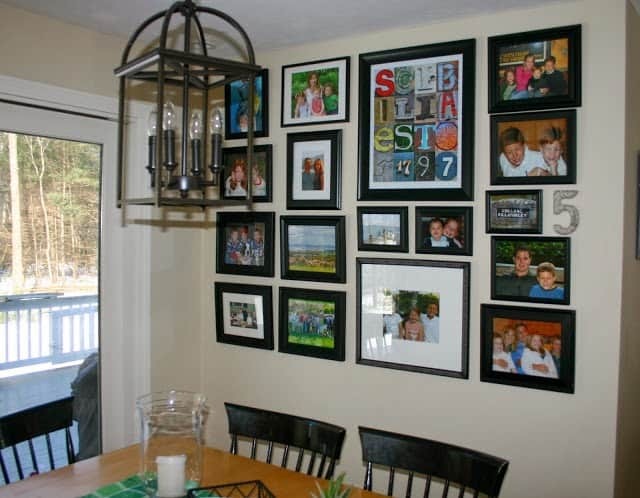 Your gallery walls are Awesome! 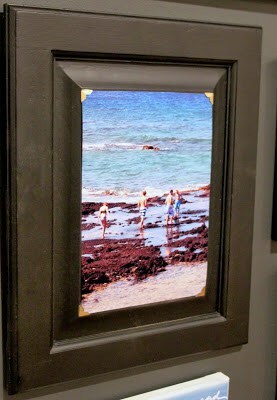 And I love the cabinets as frames, that's so creative and resourceful too. Thanks for sharing! What a smart idea my friend! And I am with you, the more gallery walls the better. So clever! Way to re-use and re-purpose. + one can never have too many gallery walls! Great idea! Love the gallery walls! You are amazing and have some of the best ideas. I need some of your creativity in my life. such a great idea, lisa! I love your gallery walls. Great ideas! 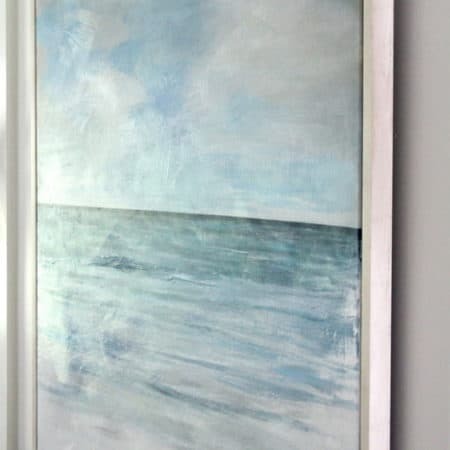 I didn't know you were a gallery wall guru Lisa!! Love them all!!! 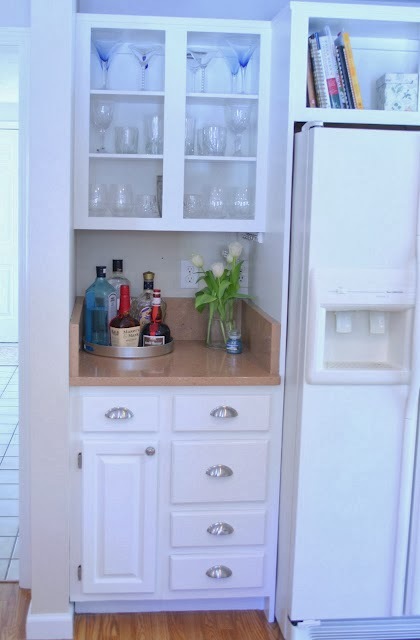 And that cabinet door idea is brilliant – re-purposing items around the home is great especially if it can be done beautifully just like you did! Have a great weekend!